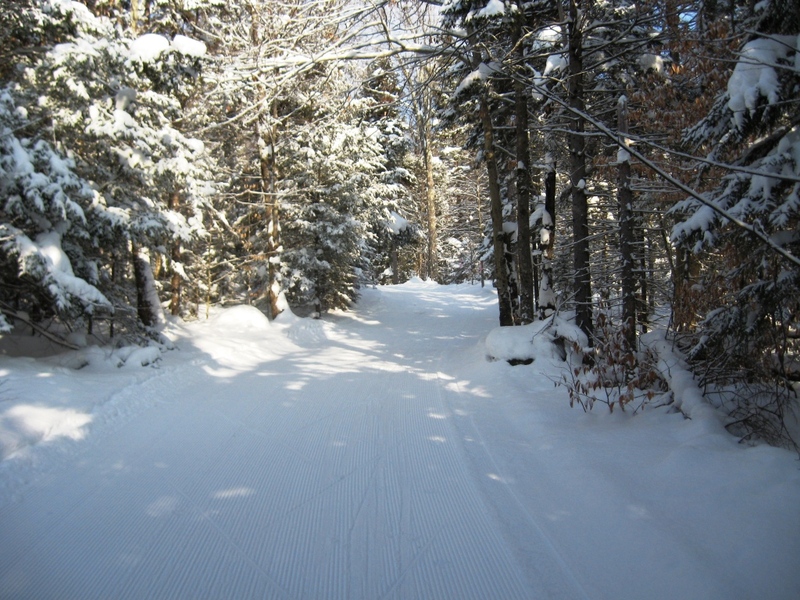 Last Sunday finally gave me what I was looking for – blue skies, blue wax conditions (for those of you on waxable cross-country skis) and great snow cover – perfect for the first ski posting of the season. 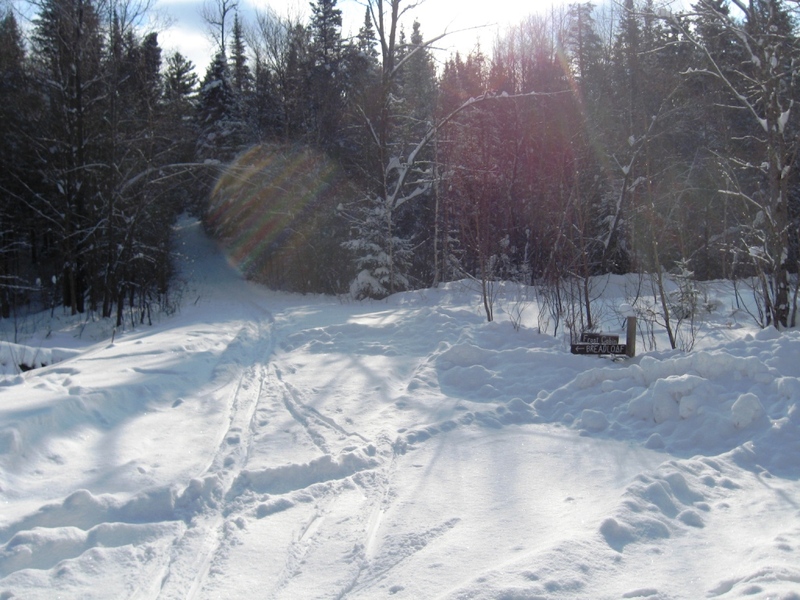 I decided to begin the day’s ski from my home area- the Rikert Ski Touring Center operated by Middlebury College, and make the route a mixture of well-groomed touring center trails and lightly traveled remote paths. 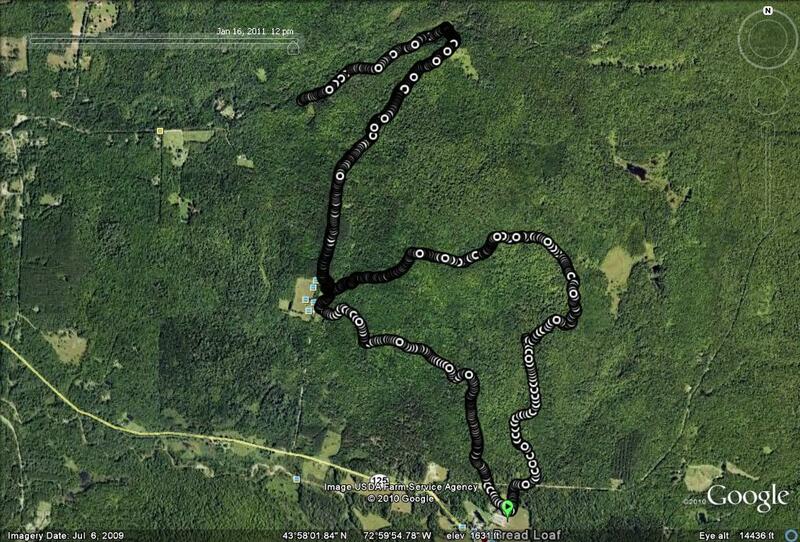 The day’s route began by reversing the route described in one of my posts from last winter, entitled “The Robert Frost Cabin”. Heading up Craig’s Hill, the beauty of the fresh snow and groomed trail provided all I needed to justify stopping for a picture. At the top of the first hill, I took a left on the “Figure 8” trail, and then followed the signs leading to the Frost Cabin. The lack of any truly bitter cold subzero days this winter have made it so that many of the surface streams are still running, rather than iced over, and in a few spots, I had to chose my path carefully to avoid waterskiing. Around the periphery of the Frost Fields, the 2-3 inches of snow from the previous nights snow on packed trail made for pretty easy skiing, but the snow was up to my knees in the unpacked powder! Joining the trail heading into the woods behind the Frost cabin at the top of the meadow, which by this point in the season was pretty well packed by previous skiers, brought me to the site of the title of this entry – the Wagon Wheel Road. The Wagon Wheel Road was so named due to the presence of dance hall by that name which operated at the end of the road, where the Rikert Trails meet the road, until about 60 years ago. I wanted to try and find a source of information on this former Ripton hot spot, but found the best information from an unlikely source. A friend told me that a well-done booklet on the history of Ripton was put together by the 5th and 6th grade classes of the Ripton Elementary School back in 1996, and that it might have some information on The Wagon Wheel. Fortunately, I learned that a copy of this book was available on the bookshelves of the Rikert Touring Center. According to this source, the dance hall operated from 1950-1952 with dancing every Saturday night in the summer, and was owned an operated by one Leonard Zeeman. Although the language used to describe this site is appropriately guarded, given the age of the authors, one gets the impression that it was a pretty wild place! They also report that the owner, who was also a contractor, collected enough beer bottles that he used them to build the cellar walls of a home he constructed in Middlebury. The dance hall stood derelict until 1962, when it was torn down, leaving behind just another cellar hole. With all the snow, there was no chance of finding this, but a small clearing at the end of the road appears to be a good place to begin searching for it in the spring. Possible site of "The Wagon Wheel"
My original plan was to follow the Wagon Wheel Rd as far as I could towards its source in the more civilized parts of Ripton, but was surprised by the fact that the upper reaches of the road were actually plowed. There was enough snow at first, but after about a km, the cover got too thin to ski, so I reversed my path, and headed back to the touring center. When I reached the Frost meadow, I took the upper trail back, which led to the well-groomed tracks on the outer Frost trail. From this high point on the terrain, I descended to the touring center to complete this 11.5 km route. 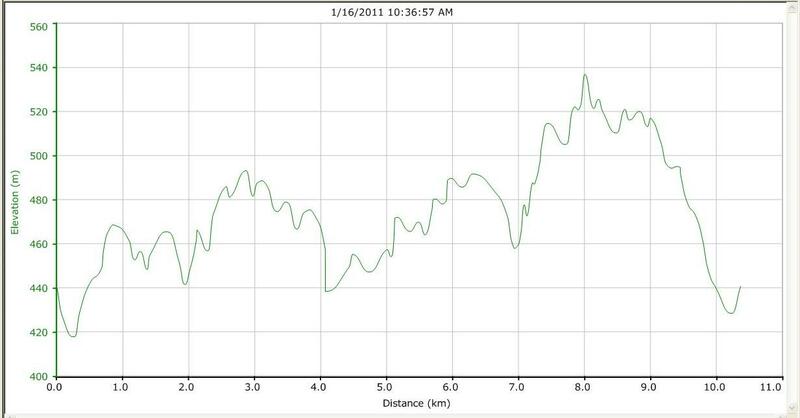 Once again, I am reverting to the common use of metric measurements when describing nordic ski routes, as is common. Curiously, the only time I have received any “troll comments” on my postings was last winter when one reader took offense at my use of this Unamerican system of measurement!